May is brain tumor awareness month; the leading cause of cancer-related death in children is, unfortunately, one of the least-funded areas of cancer research. Jack's Angels Foundation supports pediatric brain tumor research for DIPG, the most lethal brain tumor, with its 2nd Annual "Art for Jack" event, May 20, 2014 in Acton, CA. May is Brain Tumor Awareness Month; the leading cause of cancer-related death in children remains one of the least-funded areas of cancer research. It should be generally known that 4% of the National Cancer Institute’s (N.I.H.) yearly budget for cancer research is allocated for all pediatric cancers. Because there is so little industry(pharmaceutical) investment, pediatric cancers suffer the most from cuts to the NIH. Public awareness of this fact has the potential to create change in the system. Jack’s Angels mission is awareness, support and research for DIPG, (diffuse intrinsic pontine glioma) a pediatric brainstem tumor responsible for 80% of pediatric brain tumor deaths annually, no survivors, and no significant progress to this effect in well over 30 years. Just approved in April 2013 as a Public Charity, Jack’s Angels supports the DIPG research fund at Children’s Hospital Los Angeles, the regional Children’s research institution. “The other half of the financial equation that often gets ignored is the research institution itself, its doctors, researchers, and other personnel. Creating a specific fund for pediatric brain tumor research will allow for more creativity in research protocol and collaboration between institutions. We hope that one day there will be such a fund at every major children’s research institution in the US, that for diagnosed children and their families, hope may begin to replace certain grief. Many neuro-oncologists agree that progress in this area will invariably benefit all of cancer research, our understanding of the brain, and our approach to medicine,” comments Janet Demeter, founder of Jack’s Angels. 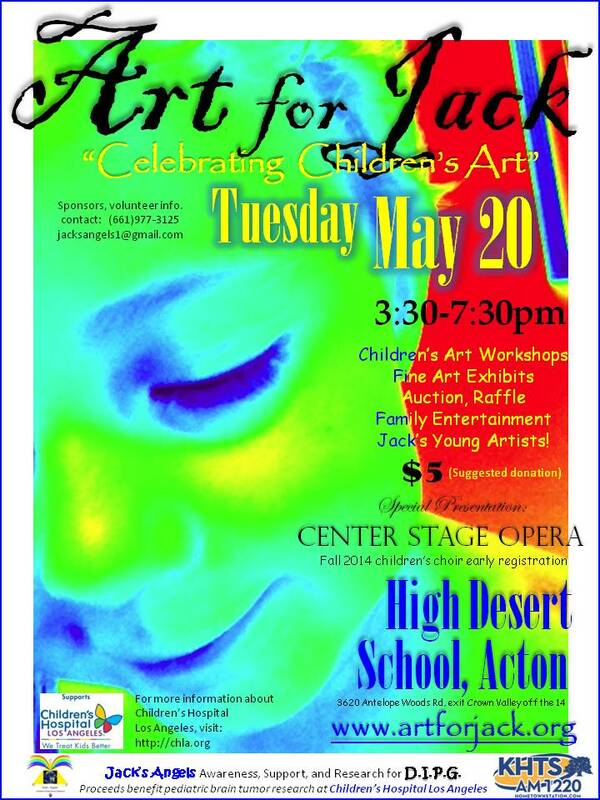 Jack’s Angels is continuing its campaign to help Jack, “Count to a Million!” for pediatric brain tumor research at Children’s Hospital Los Angeles with its 2nd Annual, “Art for Jack, ‘Celebrating Children’s Art’” event on Tuesday, May 20th, 3:30-7:30pm at the High Desert School MPR in Acton. The event features children’s art workshops, family entertainment, art exhibits, auction, raffle, and a special presentation of Center Stage Opera, with early registration available for the new children’s choir (K-6) starting this fall 2014. For more information about the event and Jack’s Angels, visit http://www.jacksangels.org. Jack’s Angels was founded in loving memory of James-William “Jack” Demeter (8/30/08-7/30/12), who was diagnosed with DIPG October 28, 2011 and died roughly 9 months later, the median survival time for children diagnosed with DIPG . The foundation and its name was inspired by the love and support of the local communities of Acton, Agua Dulce, and Santa Clarita, and the people, who demonstrated with their hearts that our children must come first, not last. The business of government, medicine, and pharmaceutical research puts profit, not children’s lives, first, with respect to cancer research. We believe that this absolutely can change with public support and attention brought to our representatives in government. James-William "Jack" Demeter, 8/30/08-7/30/12Jack's Angels was founded in loving memory of Jack "Art for Jack" event supporting pediatric brain tumor awareness and promoting the arts for children Jack's Angels press release for pediatric brain cancer awarenessMay is Brain Tumor Awareness Month; the leading cause of cancer-related death in children remains one ot the least-funded areas of cancer research. 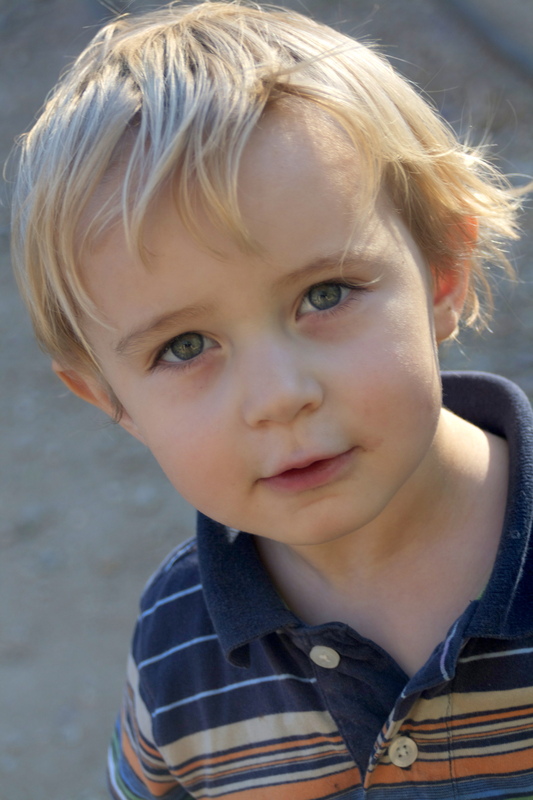 Jack's Angels Foundation is dedicated to changing a diagnosis of grief to one of hope.